Our frame and body department can repair everything from door dings to major frame and unibody damage. We use a drive-on Kansas Jack World Rack system that is equipped to repair frame and unibody damage. Vehicles can be mounted and have multiple pulls simultaneously to restore the structure of your vehicle to factory standards. We also use the Shark computerized measurement system with printouts of the damage, before and after correction, with great precision. Clydesdale Auto Body guarantees exact color matches. To replicate the factory finish on your vehicle, we use the Computerized Glasurit Mixing System by BASF, the worldwide leader in coatings technology. Spray booth personnel are trained by Glasurit factory representatives to derive the finest results attainable using this advanced painting system. The system includes a Color Max option, 3-M Color Corrective Test Lamps, and modern Short Wave Paint Curing System. Combined with our "Welbilt FB9" Downdraft Spray Booth/Oven, this highly precise system allows our expert painting technicians to match even the most challenging high-metallic, two- or three-stage colors. 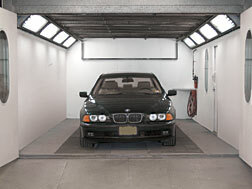 Our spray booth/oven is a "Welbilt FB9", considered the "Mercedes" of booths. We can control the environment in this booth and provide a factory finish equal to the finish on your vehicle in both texture and color. 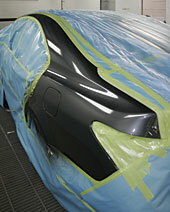 All of the vehicles and parts we paint are baked to ensure that the quality will be equal to the factory finish. Every vehicle is cleaned and detailed in-house in our own detail salon, and carefully inspected to confirm that every cosmetic, electrical and mechanical aspect of your repair meets our rigorous standards  before we schedule your vehicle for pick-up, or delivery to your door. and texture of your vehicle's finish  guaranteed.